I love to do family reunion presentations to church groups and women’s conferences. At my recent presentation one of the dear grandma’s that attended expressed some concern about doing a three day family reunion and it occurred to me (kind of like one of those “could’ve had a V-8 moments in the commercials)- have I ever mentioned that your reunion doesn’t have to last three days or two or even all day? 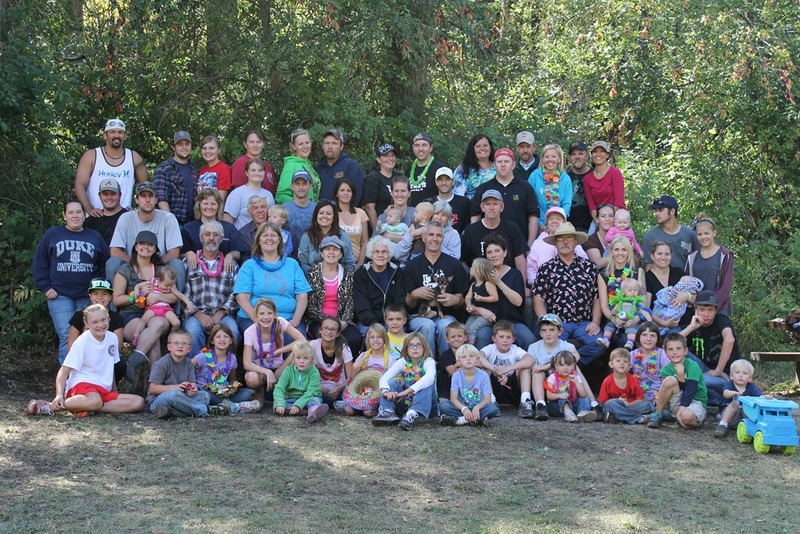 A family reunion can be a fun afternoon with your family at the park, swimming pool or the family homestead. Any time you can get together as a family is a good thing and counts as a family reunion. So I thought I’d tell you about a fun party idea for abbreviated family reunion. 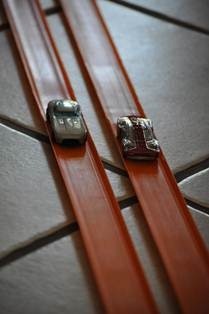 My family loves to have their own car races- Pinewood Derby or Hot Wheels race. If you know anything about scouting you know how fun and popular a Pinewood Derby can be. 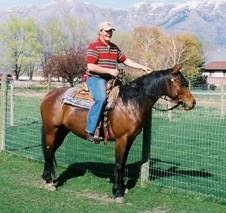 About 10 years ago we had derby at our family reunion. We let anyone that wanted to participate bring a derby car. It could be one that they had made in the past or one that they made just for our derby. We awarded prizes for how the cars looked and how they performed. 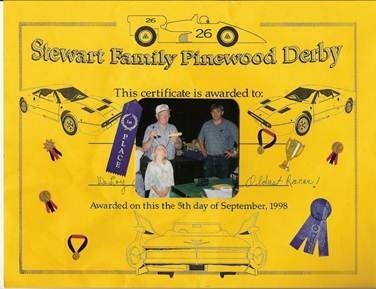 I heard of a family that passed out unfinished Pinewood Derby kits to their family as they arrived at their family reunion. They gave them an hour to put their cars together and make whatever alterations they wanted to their car. When the hour was up they began the race with roughly finished cars. It was quite surprising to me how excited everyone was about participating in the derby. One of my nephews even had his car professionally painted. When my brothers and I were little we used to have Hot Wheels races and the tradition continues with our children today. In fact, if any of my nieces and nephews read are reading this blog just remember Aunt MO ALWAYS has the fastest car!! The track we used to use is now orange “vintage” track and you cannot buy it at the store or online. However, you can, always find it on eBay. The most important part of your race is the starter which you see pictured here. 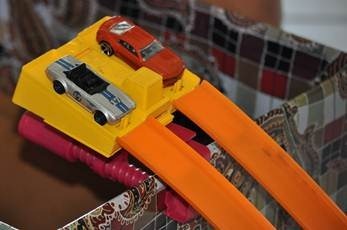 We love to get Hot Wheels cars in our Christmas stocking and then have a “race day” during the holiday. At other times of the year we converge on the local toy store in search of the fastest car rolling them back and forth in their clear containers and checking them for weight. We limit everyone to just two entries in our double elimination tournament. 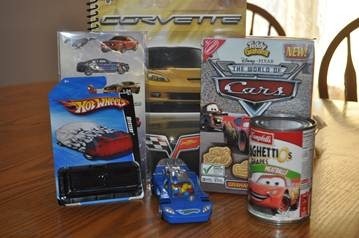 I’m always on the lookout for Hot Wheel and Nascar type prizes and store them in a box until the next family race day. Notebooks, stickers, candy and even Spaghetti O’s make fun prizes for your race. One final idea that I have never tried but sure sounds fun is to play a car relay race as a warm up before the big race. CAR RELAY GAME: Have teams line up and each person in the team has a certain action to do. For instance, the first person in each group is a flat tire and hops on one foot; the second person is a broken steering wheel and runs zig-zag; the third person is a rusty transmission and takes three steps forward and two backwards; the fourth person is stuck in reverse and runs backward; the fifth and sixth people are a car with a trailer – one runs behind the other grabbing on. The movie “Cars” sure made it easy to find auto type decorations and novelties. 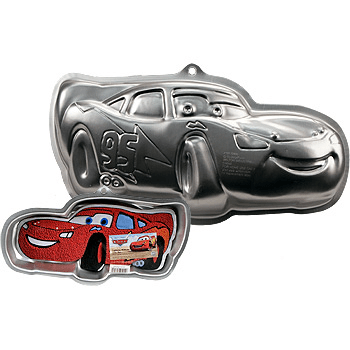 Wilton put out a Cars cake pan that was fun and fruit chews and cookies helped complete the party theme. If you have purchased your Christmas ham give yourself 1 point. If you have purchased a Christmas turkey give yourself 5 points. If you shot a Christmas goose, give yourself 2 points. If you’ve put Christmas decorations outside your home, give yourself 1 point. If you checked to see if they were working give yourself 5 points. 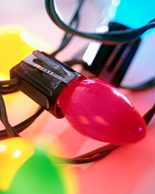 Take 2 extra points if your lights were still working when you after put them up. If you will have 10 or less people at your table for Christmas dinner give yourself 1 point, if you will have more than 10 people at your table for Christmas dinner take some headache medicine, put your feet up and give yourself 5 points. 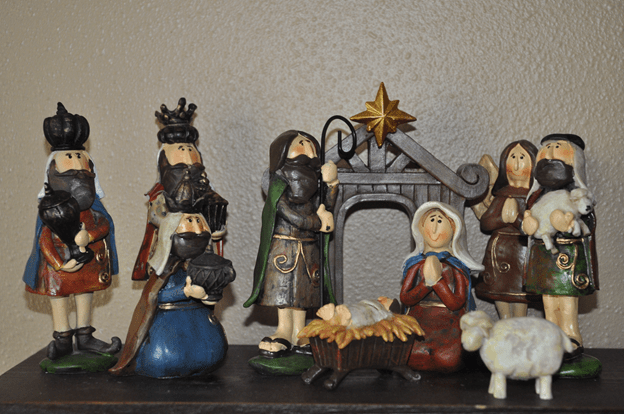 You may want to attach a nativity scripture to each nativity piece. You can find a free download of suitable scriptures at www.familyreunionhelper.com. 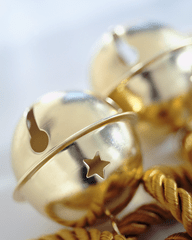 Deliver one piece of the nativity each night for 12 nights– the last one being baby Jesus on the Christmas Eve, December 24th. For the last 50 years my family has recorded their favorite family memories on photographic slides that can only be viewed with a slide projector. 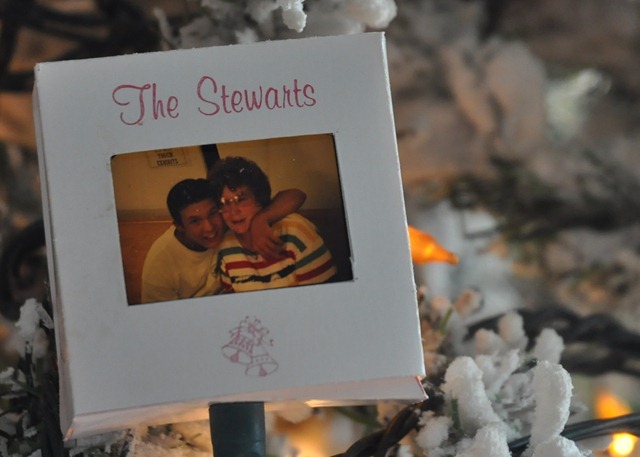 As much as I love gathering the family together for a slide show I was thrilled when Uncle Steven came up with a brilliant idea for making slide ornaments for our Christmas tree. 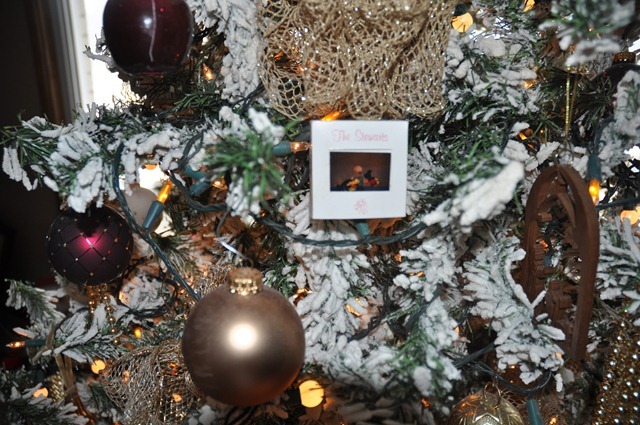 Slide ornaments are easy and inexpensive to make. 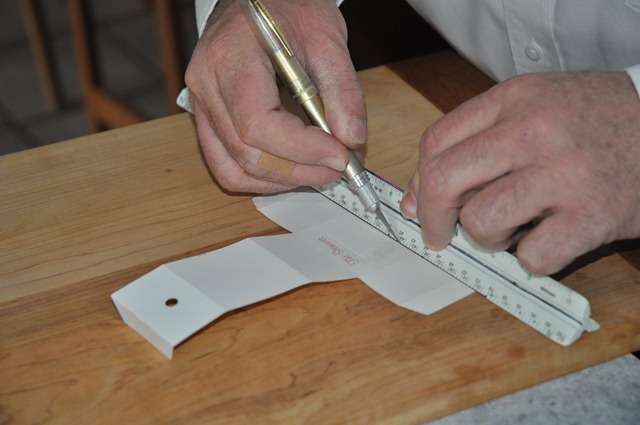 There is quite a bit of cutting, folding and taping involved but the most difficult part of making slide ornaments is choosing the slides you want to display on your tree. It is fun to use slides from past Christmases, family reunions or especially embarrassing for children and fun for parents is to use pictures of children when they were small. We had our name printed on our slide box but we found that made it a little restricting as we couldn’t use vertical slides in our ornaments without making our name look funny. I would recommend not using any words or graphics that will limit your options. We used a good pair of scissors to cut out our ornaments and an X-acto knife and ruler to cut out an opening for the slide. Tape the slide to the inside of the box then fold and fasten together with doubled sided tape. Display with white or clear lights. Your slides will be whatever color the light is. You can punch the hole for the lights in the top or bottom of the box depending on how you want the ornament to hang. Store slide ornaments in a shirt box for next year’s tree. 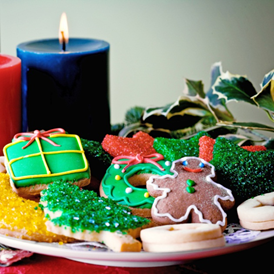 They are are long lasting and make a fun family tradition during the Christmas season. My family didn’t go trick or treating when I was a kid, we attended school carnivals and had fun celebrations at home. Uncle Steven’s family perfected trick or treating and got it down to a science. Somehow, when Uncle Steven and I married we took the traditions of both families and through trial and error came up with our own family traditions. So here’s a few of our favorite food and games for this spooky time of year. 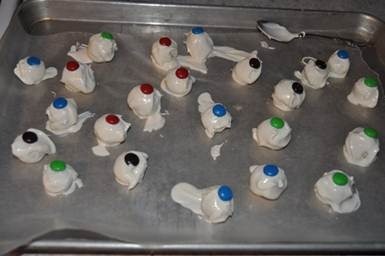 The first is a recipe my daughter, Megan, found and it is so yummy she has been banned from making it again this year- these eyeballs are just so good we can’t stop eating them! 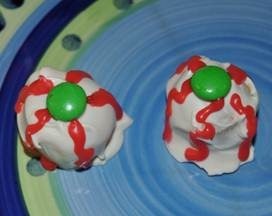 Bouncing Eyeballs Take a ping pong ball and decorate with markers to look like blood shot eyes. Then get a plastic pumpkin or party cups. Now give each child an eyeball and place the plastic pumpkin or cup at the bottom of stairs or across the floor. Have each player toss or bounce the eyeball down the stairs or across the room. The goal is to see if their eyeball bounces into the pumpkin. You can give a prize to those that get it in the pumpkin. Also for young kids, you may want to place paper cups together and have each cup worth a prize. My favorite hair stylist, Stephanie, shared this recipe while she was doing my hair on Saturday. Of course, my daughter and I had to come right home and try it! 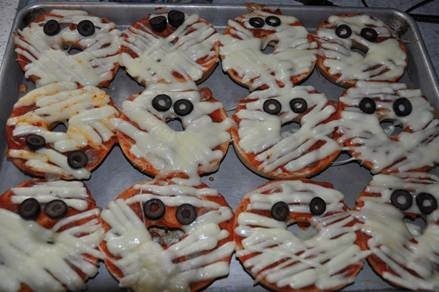 To make pizzas look like mummies just lay strips of cheese pulled from a cheese stick across the muffin for the mummy’s wrappings. This was the hardest part of this recipe for us. Arranging the cheese “just right” takes a little talent- you want the cheese to look like “wrapping” not a picket fence or a white window blind. 1. For each mummy, spread a tablespoon of pizza sauce onto each bagel half. 2. 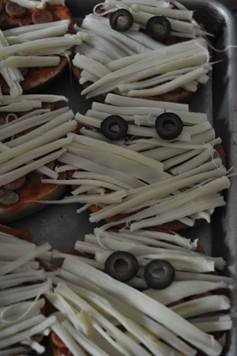 Set olive slices in place for eyes. Bake 10 minutes or until cheese melts. 3. Bake for about 10 minutes or until the cheese is melted and the bagel is toasty. Equipment Needed – One roll of toilet paper for every team. Split into teams of two and give each team a roll of toilet paper. Then one person tries to turn the other into a mummy. Everything has to be covered except the eyes. First team done wins. Boo! This ghost will surprise and delight your family and friends when you turn off the lights and let his flaming ghost’s eyes flicker and dance. This fun and clever cake is quick and easy to make. 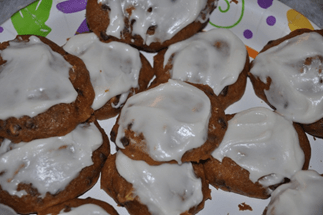 I was given this recipe the first year Uncle Steven and I were married. Bake any flavor cake mix in a 9 X 13 pan. Grease and flour pan well so that you can dump it out onto f flat cookie sheet or foil wrapped cardboard. 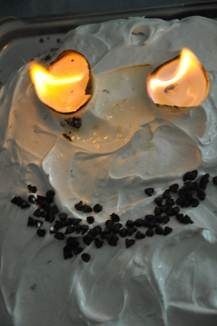 Cut cake into your favorite ghostly shape. Frost with Grammie’s famous “Fluffy Frosting” recipe. Grammie used this frosting in place of 7 minute frosting because you don’t have to cook it. Adding the HOT water is the secret. Whip on high speed for 10- 15 minutes. Frost cooled cake with fluffy frosting. Place the 2 egg shell halves you reserved round sides down on the cake for the eyes. Place one sugar cube in each shell half. Make a mouth out of licorice string, chocolate chips or candies. Just before serving, pour ½ teaspoon of lemon extract over each sugar cube. Light the eyes. Choose one person to be the "ghost". Have everyone but the ghost stand at the home base while the ghost runs off to hide somewhere outside. Chant slowly as a group, "One o’clock… two o’clock… three o’clock…" and so on, up to twelve o’clock. Then shout, "Midnight! I hope I don’t see the ghost tonight!" Alternatively, "Starlight, star bright, I hope to see a ghost tonight!" Leave the home base and search for the ghost in the yard. The ghost’s job is to jump out, surprise, and tag a player. When anyone encounters the ghost they should yell, "Ghost in the graveyard!" and try to run away. When the ghost catches someone, they become a ghost too. Anyone who is able to run back to home base is safe. Have all the people who were caught go and hide with (or close to) the original ghost. The people on the home base start again with the chant, "One o’clock… two o’clock…"
Continue the game like this until everyone is caught. The last person caught becomes the ghost for the next round. Preheat oven to 350 degrees. Lightly grease two baking sheets. Beat the pumpkin, eggs, together in a large mixing bowl. Stir in the cake mix until well blended and creamy. Add chocolate chips if desired. 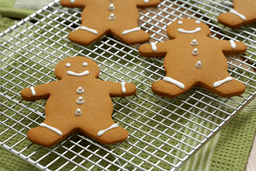 Drop by spoonful’s on prepared baking sheets. Frost with cream cheese frosting. Bake in preheated oven until tops are firm when lightly touched, 10- 12 minutes. Cool on racks. “Crazy” is a relative term in my family! 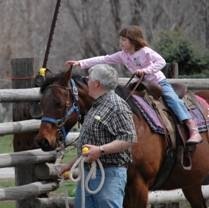 Easter Egg Hunt on Horseback! The best Easter Egg hunt in the entire universe is held the Saturday before Easter at Canna Bay Farms. Humans of all descriptions gather; greenhorns, cowboys and babies as well of horses of all breeds, colors and training, to find Easter Eggs hidden all over the farm. At our Easter Egg hunt it’s not about the eggs- it’s about the hunt! To make things fairer for the inexperienced and younger riders, Uncle Steven and I hide the eggs according to color. Each rider has a different color or style of egg. For instance, this year we have basketball eggs for Kory, purple eggs for Megan, football eggs for Ryan, chicken shaped eggs for Brynna, pink eggs for Janie and so forth. We’ve been collecting eggs for years, and since we ask everyone to leave their eggs and just take the candy home, we have quite a collection. Assigning each rider their own color makes it possible for us to hide the eggs according to the rider’s ability. Because Megan, Kory and Janie are experienced riders we hide their eggs in places that are hard to see and difficult to get to, but we hide green horn and children’s eggs in plain sight and in places easy for them to reach. After the hunters find all of their eggs they are allowed to hunt for the golden eggs that have special prizes in them such as movie tickets, gift certificates and coins. This is the most exciting part of the hunt as riders become a little more daring and often find themselves racing for the same golden egg as another rider. 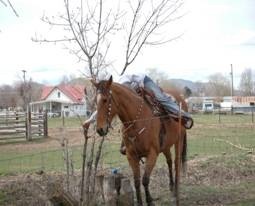 I recently read an article about how to hold a “safe” Easter Egg hunt and although I don’t think our horseback hunt would qualify as “safe” I am happy to report that we have never had an accident- I’m not saying we haven’t come close- but no one has ever been hurt. Our most unusual hunt was the year my son, Kory, used the hunt as a means of proposing to his future wife, Janie. We hid her diamond ring in one of the eggs and everyone held their breath as Janie hunted for her eggs. When Janie found the egg the ring was in, I was so afraid the egg would come open, that I finally had to ask her if she wanted me to hold her eggs while she continued searching for more eggs. Of course, Janie said “yes” when Kory popped the question, and they and their 18 month old daughter live “happily ever after” about 5 miles from us. Because the horses haven’t been ridden much during the winter months they are usually feeling a little frisky for our Easter Egg Hunt. We used to give the riders a plastic shopping bag to put their eggs in but some horses would spook at the crackling noise the bags made so now everyone just wears a hoodie with pockets to put their eggs in. We have hidden as few as six eggs per person and as many as 12. The gold eggs are extra and although we don’t limit how many eggs a person can find, they are pretty good to make sure that everyone finds at least one golden egg. 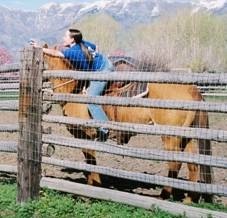 I always fill extra eggs in case we have an unexpected rider, which happens more often then not. For more unusual Easter Egg hunt ideas and fun family reunion themes, visit www.familyreunionhelper.com, and check out the “Home for the Holidays” family reunion. “If you only have one smile give it to the people you love." 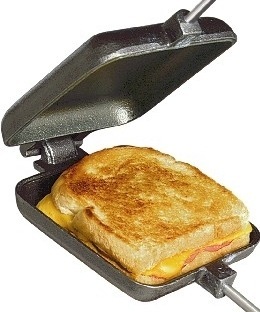 What do Pudgies, Toasties, Jaffles and Hobos Have in Common? Pie Irons are available in both cast iron & aluminum. Our family prefers cast iron. They come in several different shapes; round, square, oblong and double. For our family reunions, we only use square irons. A slice of bread fits perfectly in a square pie iron but the “waffle” pie irons I’ve seen look fun too. Some day I’m going to buy waffle style irons for our family reunion and use them for breakfast. Aunt Lynn doesn’t think she’s had breakfast unless she has had a piece of toast so we’ve even used our pie irons for toast. At our family reunions, we like to make fruit pies in the evening while we are sitting around the campfire visiting, singing or playing games. About ten years ago, at a family reunion, cousin Mindy suggested that we sprinkle our freshly baked pies with sugar and cinnamon when we dump it out of the pie iron. Yummy! Some of our favorite flavors of fruit pies are lemon and raspberry. Another family favorite at our family reunions are “Cherry Cheese Turnovers- the recipe is below. Butter or add cooking spray to one side of each slice of bread and place buttered-side-out in pie iron. Fill with a Tablespoon of cream cheese and a Tablespoon of cherry pie filling. Cook on camp stove or in fire until golden brown. Sprinkle with sugar and cinnamon. Pie Irons are great for making ham and cheese sandwiches, individual pizzas and dessert pies but you don’t have to always use bread pockets when you use your pie irons. At our family reunions, we have made omelets and hash brown potatoes in our pie makers. Use your imagination- I even heard of a family that makes Baked Alaska in their irons. That’s a recipe I’ve got to try! Here’s a fun recipe using tortillas. Sour Cream, olives, salsa etc. Spray both sides of Irons well, with non stick cooking oil. Lay Tortilla in middle of one Pie Iron. Fill with 3 to 4 strips of cooked and thawed chicken, sprinkle 1/8 cup of cheese and taco seasoning to taste. Fold the Tortilla in on all sides, close Pie Iron and cook until Tortilla is golden brown on both sides. Serve cut in half with sour cream and salsa. A basic pie iron can be purchased for about $20.00 at Sporting Goods/Camping & Outdoor Stores, BBQ & Kitchen Specialty Stores, Campgrounds, RV Stores, & Hardware stores. I once stumbled onto store liquidation and bought pie irons for $6.00 a piece. I bought every iron they had in stock. An online resource . You don’t need a pie iron for every person at your family reunion, just cook your pie and pass the iron onto the next person. After you’ve introduced your family to pie irons at your next family reunion everyone will want to have one- selling pie irons might even be a great fund raiser! 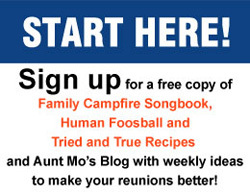 More great recipes can be found at www.familyreunionhelper.com under “Tried and True” recipes.